These are not large charts but I believe they are unique. They are attractively packaged in hanger bags and contain all the necessary materials needed to complete them. Each kit contains Zweigart 14 count white Aida, a gold plated needle, pre-sorted Anchor stranded cotton threads attached to printed organiser cards, full instructions and a large black and white chart. If several colours of backstitches are needed, they are distinguished by colour code. A colour picture on the cover shows what the finished design will look like. This Highland range is being extended and will include Urquhart Castle on Loch Ness and Loch Lomond. New designs are being produced for other areas including South West Scotland and the Yorkshire Dales. A new series of smaller greetings card cross stitch kits will be available shortly. 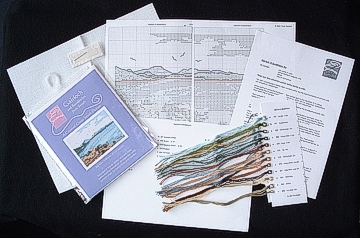 Although all these needlecraft kits are currently based on Anchor threads I am considering the possibility of offering chart only packs with DMC thread options. I apologise to overseas visitors who use different terminology e.g. floss instead of thread, please e-mail for clarification if necessary.